Readings & Workshops (West) director Jamie Asaye FitzGerald blogs about Poets & Writers’ seventh annual Los Angeles Connecting Cultures Reading at Beyond Baroque Literary Arts Center in Venice, California. Each year for the past seven years, Poets & Writers has held the Los Angeles Connecting Cultures Reading, which astounds audiences with the diversity of its performers and their unique voices, and the power of the work read to redeem, heal, and delight. We select five organizations that serve culturally diverse groups and have received support from the Readings & Workshops (R&W) program to help curate the event. Each organization chooses readers to represent them at the reading. This year’s event was held at Beyond Baroque on June 4, 2017 and included 826LA, a writing and tutoring center; Beyond Baroque, a literary/arts center; the Boyle Heights Arts Conservatory, serving homeless and at-risk youth; Bittersweet: The Immigrant Stories, a reading featuring the voices of immigrant writers; and Urban Possibilities, serving the urban poor of Los Angeles. It’s wonderful to witness the general comradery between the presenters as they meet and discover one another’s work. So Hyun Chang, representing Bittersweet: The Immigrant Stories, read in Korean his poem “Sugarcane Arirang,” recounting the first Korean American’s long days in the sugar fields of Hawaii, where they would chant a song of hope, “arirang, arirang,” to help pass the time. Hack Hee Kang read a poem using the Korean dish bi bim bap to convey a sense of loneliness and longing, and Jun C. Kim moved silently as a recording of his poem played over the loud speaker. We give our thanks to the organizations, project directors, and writers who made this event possible, as well as Beyond Baroque, for hosting and for their support. To keep up with Readings & Workshops news and events, such as Connecting Cultures, please be sure to sign up for our quarterly newsletter, Readings & Workshops Presents. Major support for Readings & Workshops in California is provided by the James Irvine Foundation and the Hearst Foundations. Additional support comes from the Friends of Poets & Writers. 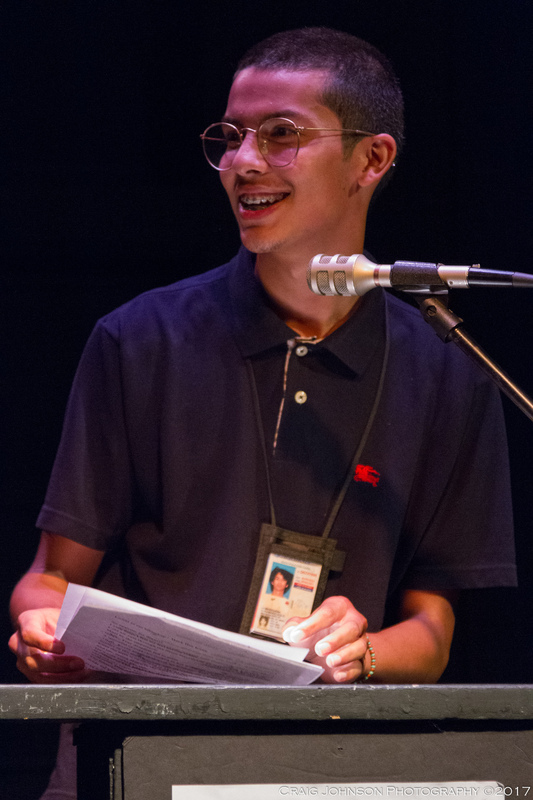 Photos (top): Teen poet Xolo Maridueña representing the Boyle Heights Arts Conservatory (Credit: Craig Johnson Photography). 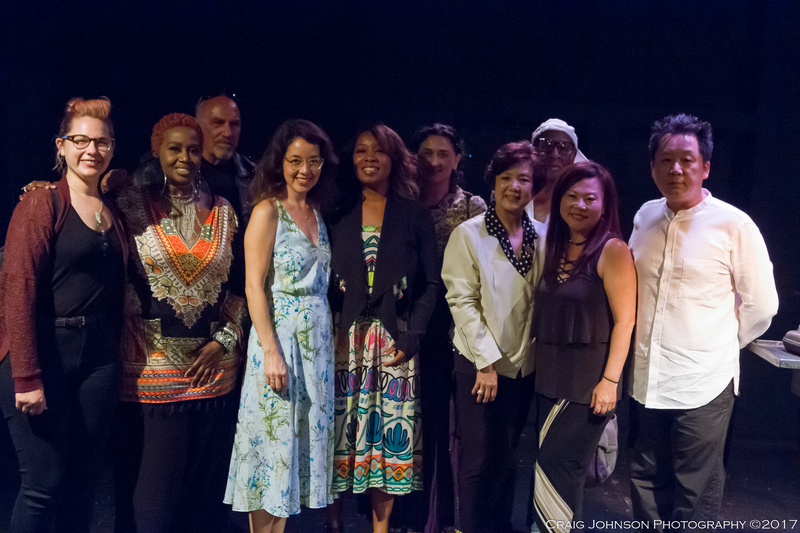 (bottom): (left to right) Brandi Spaethe, Norma L. Eaton, Keith Brown, Jamie Asaye FitzGerald, Eyvette Jones-Johnson, Ambika Talwar, Hack Hee Kang, audience member, Tanya Ko Hong, Jun C. Kim (Credit: Craig Johnson Photography).